The Raspberry Pi is a credit card sized computer that packs a punch well above its size. Set up with compatible ancillary devices a pocket sized, extremely capable and fully integrated media center can be created. By back powering the Raspberry Pi we can eliminate the need for an ugly, bulky USB hub. This article will purely cover hardware set up, theres plenty of information on software set up written by more qualified individuals all over the web. Firstly and most obviously a Raspberry Pi board is required. The official distributor is RS Components but many other outlets also sell individual boards and bundles. It is possible to use the board without a case but makes for a much tidier build if one is used. The particular case used for this set up was purchased from ebay for around £5 with the addition of an SD card cover it makes for a robust and good looking device. In order to install the operating system an SDHC card is required. Two or three different cards were tested with massively varying results. 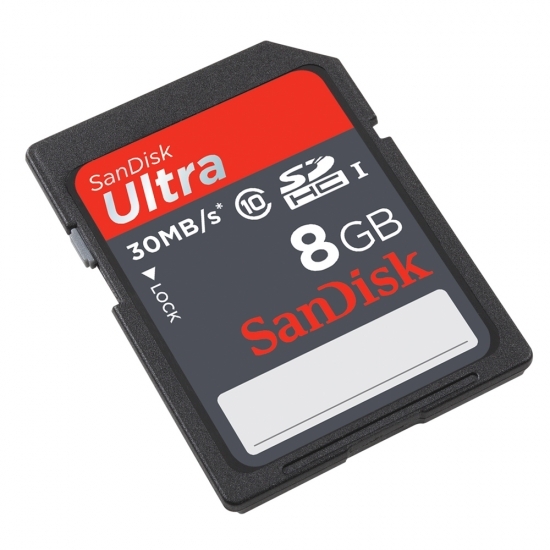 The one which seemed to give solid, fast performance was the SanDisk Ultra 8GB class 10. The SanDisk card is what this website is running on right now and has been operating solidly for over a year without issue. Larger capacity cards of the same type may work equally well but are unnecessary for this application as only the operating system resides on it. Audio and visual media is stored on a 1tb USB hard drive stuck to the bottom of the Pi using 3M sticky pads. The hard drive used is a Samsung/Seagate 1TB 2.5 inch 5400RPM SATA II Hard Disk Drive purchased from Amazon. One of the prerequisites of this setup is to not use a usb hub, a tangle of wires and power supplies would be very ugly and cumbersome. The 2.5" drive is low powered so aids in achieving this goal, it also mates up nicely with the Pi when stuck together. The case is a generic Chinese one that can be found all over the web for as little as £3. When purchasing the case it may state maximum hard drive capacity as 500gb, this is incorrect, out dated information which dates back to when the largest available 2.5" drive capacity was 500gb. The case will work fine with a 1tb drive. The hard drive case comes with a USB Y lead to allow extra power from another usb port to be used if the drive doesnt power up with just one plugged in. In practice the inteded use of the cable has never been required. We can make use of this extra bit of wiring to power the hard drive, whilst plugged into the Pi it will also back power the Pi. Dont be concerned about back powering your Pi in this way as the model B was modified specifically for this purpose. There is some advice given on raspberrypi.org which states not to use a power supply rated greater than 1 amp. Because we're powering Pi, hard drive and wifi dongle from one source a 2 amp power supply should be fine. You can always check the power rating of your hard drive by reading the label. To enable web and network access a USB wifi dongle is needed. The one used here is branded Sumvision which works fine but may not be readily available anymore. Many more compatible dongles are available which will work equally well and will probably be cheaper. The dongle tends to get quite hot during use so is attached to a short USB extension to keep the heat away from the Pi's case. Now both USB ports have been taken up its not possible to connect a keyboard, not a problem if a TV with HDMI-CEC is used (which most mid spec modern TV's seem to have). Simply plug in the HDMI cable and the TV's remote will operate all functions in RaspBMC. A short extension added to the USB Y lead enables power to be taken from the TV's USB socket. This arrangement is quite handy as the Pi will turn on and off with the TV. If a longer extension is used it can cause problems with the hard drive, the Pi may still power up but the hard drive wont be accessible. If any problems or glitchyness is observed using this wiring arrangement then a USB mains adaptor may be required. With RaspBMC installed and your favourite music and videos on the hard drive you have yourself a descreet, virtually silent, low power media center with all the functionality of a far more expensive system. If you enjoyed this article and would like to be informed of future updates to the site please like Titimus on facebook.